Did you know that matplotlib has an xkcd() function? This assignment is due before 11:59PM on Tuesday, February 19, 2019. Solving word relation problems like analogies using word embeddings. Discovering the different senses of a ‘polysemous’ word by clustering together its paraphrases. We can find the nearest vector in the vocabulary by looking for $argmax \ cos(x, king-man+woman)$. Omar Levy has an explanation of the method in this Quora post and in the paper. What is the dimensionality of these word embeddings? Provide an integer answer. What are the top-5 most similar words to picnic (not including picnic itself)? Solve the following analogy: leg is to jump as X is to throw. We have provided a file called part1.txt for you to submit answers to the questions above. Let us revisit SimLex-999 dataset from Extra Credit in Assignment 3. We will use SimLex-999.txt located on eniac in /home1/c/cis530/hw4_2019/data/. Displays correlation for human judgments of similarity to the vector similarities using Kendall’s Tau. In this part of the assignment we would like for you to explore how the Kendall’s Tau correlation changes based on the similarity. You may use the script we provided or create your own script. What is the least similar 2 pairs of words based on human judgement scores and vector similarity? Do the pairs match? What is the most similar 2 pairs of words based on human judgement scores and vector similarity? Do the pairs match? How do those value compare to each other? Extra points will be awarded for creativity and a more thorough qualitative analysis. Here the darkness values give an indication of how similar paraphrases are to each other. 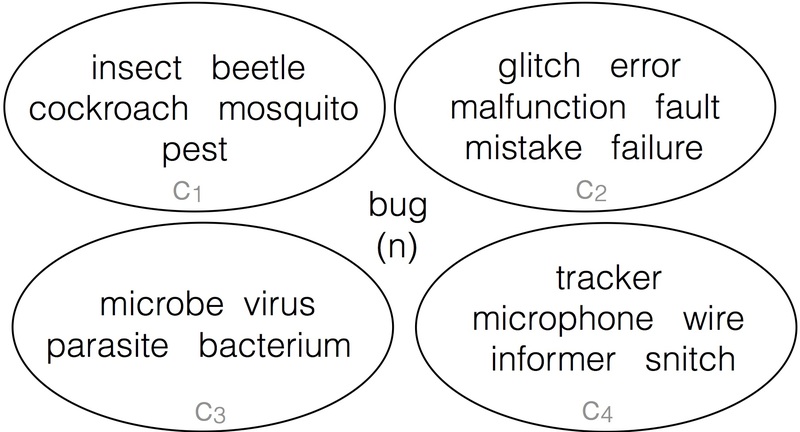 For instance in this example similarity between insect and pest is greater than the similarity between insect and error. You can read more about this task in these papers. In this assignment, we will use vector representations in order to measure their similarities of pairs of paraphrases. You will play with different vector space representations of words to create clusters of word senses. We expect that you have read Jurafsky and Martin Chapter 6. Word vectors, also known as word embeddings, can be thought of simply as points in some high-dimensional space. Remember in geometry class when you learned about the Euclidean plane, and 2-dimensional points in that plane? It’s not hard to understand distance between those points – you can even measure it with a ruler. Then you learned about 3-dimensional points, and how to calculate the distance between these. These 3-dimensional points can be thought of as positions in physical space. Now, do your best to stop thinking about physical space, and generalize this idea in your mind: you can calculate a distance between 2-dimensional and 3-dimensional points, now imagine a point with N dimensions. The dimensions don’t necessarily have meaning in the same way as the X,Y, and Z dimensions in physical space, but we can calculate distances all the same. This is how we will use word vectors in this assignment: as points in some high-dimensional space, where distances between points are meaningful. The interpretation of distance between word vectors depends entirely on how they were made, but for our purposes, we will consider distance to measure semantic similarity. Word vectors that are close together should have meanings that are similar. With this framework, we can see how to solve our paraphrase clustering problem. The input data to be used for this assignment consists of sets of paraphrases corresponding to one of polysemous target words, e.g. Your objective is to automatically cluster each paraphrase set such that each cluster contains words pertaining to a single sense, or meaning, of the target word. Note that a single word from the paraphrase set might belong to one or more clusters. The words file dev_input.txt located on eniac in /home1/c/cis530/hw4_2019/data/ is formatted such that each line contains one target, its paraphrase set, and the number of ground truth clusters k, separated by a :: symbol. You can use k as input to your clustering algorithm. For testing Tasks 3.1 – 3.3, you will receive only words file test_input.txt located on eniac in /home1/c/cis530/hw4_2019/data/ containing the test target words, number of ground truth clusters and their paraphrase sets. For testing Task 3.4, you will receive only words file test_nok_input.txt located on eniac in /home1/c/cis530/hw4_2019/data/ containing the test target words and their paraphrases sets. Neither order of senses, nor order of words in a cluster matter. There are many possible ways to evaluate clustering solutions. For this homework we will rely on the paired F-score, which you can read more about in this paper. The general idea behind paired F-score is to treat clustering prediction like a classification problem; given a target word and its paraphrase set, we call a positive instance any pair of paraphrases that appear together in a ground-truth cluster. Once we predict a clustering solution for the paraphrase set, we similarly generate the set of word pairs such that both words in the pair appear in the same predicted cluster. We can then evaluate our set of predicted pairs against the ground truth pairs using precision, recall, and F-score. V-Measure is another metric that is used to evaluate clustering solutions, however we will not be using it in this Assignment. Your task is to fill in 4 functions in part2.py: cluster_random, cluster_with_sparse_representation, cluster_with_dense_representation, cluster_with_no_k. load_input_file(file_path) that converts the input data (the words file) into 2 dictionaries. The first dictionary is a mapping between a target word and a list of paraphrases. The second dictionary is a mapping between a target word and a number of clusters for a given target word. load_output_file(file_path) that converts the output data (the clusters file) into a dictionary, where a key is a target word and a value is it’s list of list of paraphrases. Each list of paraphrases is a cluster. Remember that Neither order of senses, nor order of words in a cluster matter. get_paired_f_score(gold_clustering, predicted_clustering) that calculates paired F-score given a gold and predicted clustering for a target word. Full points will be awarded for each of the tasks if your implementation gets above a certain threshold on the test dataset. Please submit to autograder to see thresholds. Note that thresholds are based on the scores from the previous year and might be lowered depending on the average performance. word_to_k_dict = a mapping between a target word and a number of clusters for a given target The function outputs a dictionary, where the key is a target word and a value is a list of list of paraphrases, where a list of paraphrases represents a distinct sense of a target word. Write a function cluster_with_sparse_representation(word_to_paraphrases_dict, word_to_k_dict). The input and output remains the same as in Task 1, however the clustering of paraphrases will no longer be random and is based on sparse vector representation. We will feature-based (not dense) vector space representation. In this type of VSM, each dimension of the vector space corresponds to a specific feature, such as a context word (see, for example, the term-context matrix described in Chapter 6.1.2 of Jurafsky & Martin). You will calculate cooccurrence vectors on the Reuters RCV1 corpus. It can take a long time to build cooccurrence vectors, so we have pre-built set called coocvec-500mostfreq-window-3.vec.filter.magnitude located on eniac in /home1/c/cis530/hw4_2019/vectors/. To save on space, these include only the words used in the given files. This representation of words uses a term-context matrix M of size |V| x D, where |V| is the size of the vocabulary and D=500. Each feature corresponds to one of the top 500 most-frequent words in the corpus. The value of matrix entry M[i][j] gives the number of times the context word represented by column j appeared within W=3 words to the left or right of the word represented by row i in the corpus. If you are interested in building your own cooccurrence vectors, you can use tokenized and cleaned version here called reuters.rcv1.tokenized located on eniac in /home1/c/cis530/hw4_2019/vectors/. The original is here. We used the provided script, makecooccurrences.py, to build these vectors. If you want to use it, be sure to set D and W to what you want. Don’t forget to convert your new vector representation to Magnitude by constructing a Magnitude object. What if you reduce or increase D in the baseline implementation? Does it help to change the window W used to extract contexts? Play around with the feature weighting – instead of raw counts, would it help to use PPMI? 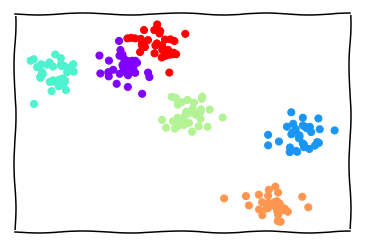 Try a different clustering algorithm that’s included with the scikit-learn clustering package, or implement your own. What if you include additional types of features, like paraphrases in the Paraphrase Database or the part-of-speech of context words? The only feature types that are off-limits are WordNet features. Provide a brief description of your method in the Report, making sure to describe the vector space model you chose, the clustering algorithm you used, and the results of any preliminary experiments you might have run on the dev set. Write a function cluster_with_dense_representation(word_to_paraphrases_dict, word_to_k_dict). The input and output remains the same as in Task 1 and 2, however the clustering of paraphrases is based on dense vector representation. We would like to see if dense word embeddings are better for clustering the words in our test set. Run the word clustering task again, but this time use a dense word representation. For this task, we have also included a file called GoogleNews-vectors-negative300.filter.magnitude located on eniac in /home1/c/cis530/hw4_2019/vectors/, which is filtered to contain only the words in the dev/test splits. Try downloading a different dense vector space model from the web, like Paragram or fastText. Train your own word vectors, either on the provided corpus or something you find online. You can try the skip-gram, CBOW models, or GLOVE. Try experimenting with the dimensionality. Retrofitting is a simple way to add additional semantic knowledge to pre-trained vectors. The retrofitting code is available here. Experiment with different lexicons, or even try counter-fitting. Provide a brief description of your method in the Report that includes the vectors you used, and any experimental results you have from running your model on the dev set. In addition, for Task 3.2 and 3.3, do an analysis of different errors made by each system – i.e. look at instances that the word-context matrix representation gets wrong and dense gets right, and vice versa, and see if there are any interesting patterns. There is no right answer for this. So far we made the clustering problem deliberately easier by providing you with k, the number of clusters, as an input. But in most clustering situations the best k is not given. To take this assignment one step further, see if you can come up with a way to automatically choose k.
Write a function cluster_with_no_k(word_to_paraphrases_dict) that accepts only the first dictionary as an input and produces clusterings for given target words. We have provided an additional test set test_nok_input.txt located on eniac in /home1/c/cis530/hw4_2019/data/, where the k field has been zeroed out. See if you can come up with a method that clusters words by sense, and chooses the best k on its own. You can start by assigning k=5 for all target words as a baseline model. You might want to try and use the development data to analyze how got is your model in determining k.
One of the ways to approach this challenge is to try and select best k for a target word and a list of paraphrases is to use try out a range of k's and judge the performance of the clusterings based on some metric, for instance a silhouette score. Be sure to describe your method in the Report. In order to stir up some friendly competition, we would also like you to submit the clustering from your best model to a leaderboard. From Task 3.4, copy the output file from your best model to a file called test_nok_output_leaderboard.txt and include it with your submission in ‘HW4: Leaderboard Without K’ following the format of the clusters file. From Task 3.2 or 3.3, copy the output file from your best model to a file called test_output_leaderboard.txt and include it with your submission in ‘HW4: Leaderboard With K’ following the format of the clusters file. The first 10 places in either of the two leaderboards get extra points (The exact number of points will be determined). i.e. look at instances that the word-context matrix representation gets wrong and dense gets right, and vice versa, and see if there are any interesting patterns. If you wish to write your report in latex, here is a template for you to get started. Continuous space language models have recently demonstrated outstanding results across a variety of tasks. In this paper, we examine the vector-space word representations that are implicitly learned by the input-layer weights. We find that these representations are surprisingly good at capturing syntactic and semantic regularities in language, and that each relationship is characterized by a relation-specific vector offset. This allows vector-oriented reasoning based on the offsets between words. For example, the male/female relationship is automatically learned, and with the induced vector representations, “King Man + Woman” results in a vector very close to “Queen.” We demonstrate that the word vectors capture syntactic regularities by means of syntactic analogy questions (provided with this paper), and are able to correctly answer almost 40% of the questions. We demonstrate that the word vectors capture semantic regularities by using the vector offset method to answer SemEval-2012 Task 2 questions. Remarkably, this method outperforms the best previous systems. Inventories of manually compiled dictionaries usually serve as a source for word senses. However, they often include many rare senses while missing corpus/domain-specific senses. We present a clustering algorithm called CBC (Clustering By Committee) that automatically discovers word senses from text. It initially discovers a set of tight clusters called committees that are well scattered in the similarity space. The centroid of the members of a committee is used as the feature vector of the cluster. We proceed by assigning words to their most similar clusters. After assigning an element to a cluster, we remove their overlapping features from the element. This allows CBC to discover the less frequent senses of a word and to avoid discovering duplicate senses. Each cluster that a word belongs to represents one of its senses. We also present an evaluation methodology for automatically measuring the precision and recall of discovered senses. 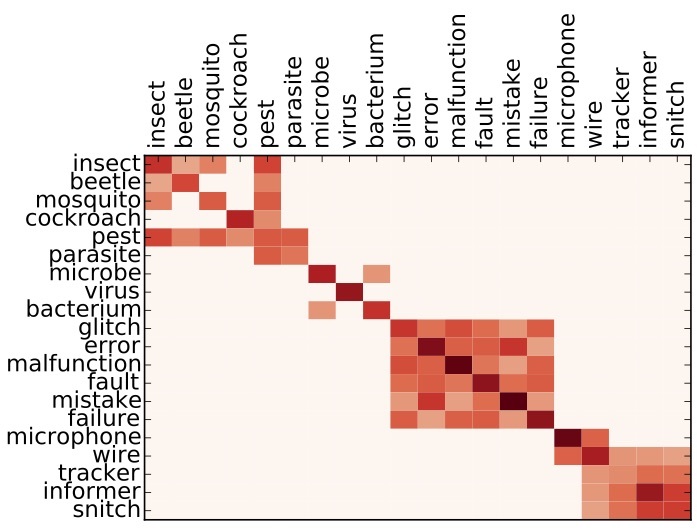 Recent work has shown that neural- embedded word representations capture many relational similarities, which can be recovered by means of vector arithmetic in the embedded space. 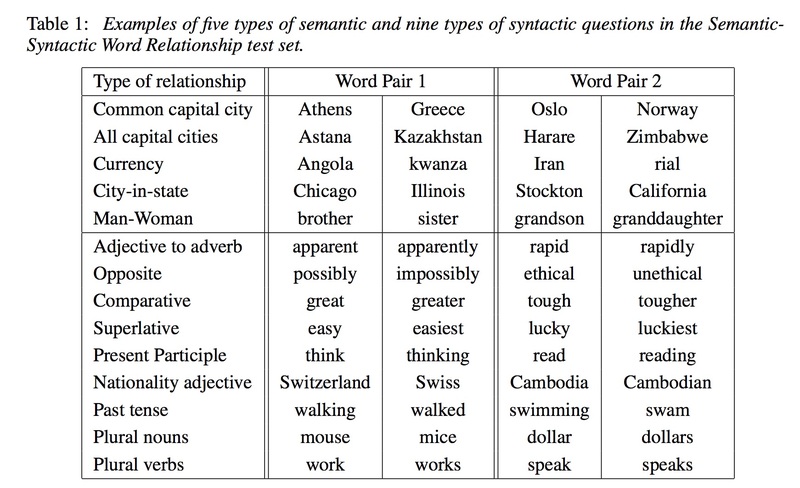 We show that Mikolov et al.’s method of first adding and subtracting word vectors, and then searching for a word similar to the result, is equivalent to searching for a word that maximizes a linear combination of three pairwise word similarities. Based on this observation, we suggest an improved method of recovering relational similarities, improving the state-of-the-art results on two recent word-analogy datasets. Moreover, we demonstrate that analogy recovery is not restricted to neural word embeddings, and that a similar amount of relational similarities can be recovered from traditional distributional word representations. Automatically generated databases of English paraphrases have the drawback that they return a single list of paraphrases for an input word or phrase. This means that all senses of polysemous words are grouped together, unlike WordNet which partitions different senses into separate synsets. We present a new method for clustering paraphrases by word sense, and apply it to the Paraphrase Database (PPDB). We investigate the performance of hierarchical and spectral clustering algorithms, and systematically explore different ways of defining the similarity matrix that they use as input. Our method produces sense clusters that are qualitatively and quantitatively good, and that represent a substantial improvement to the PPDB resource. Stephen Mayhew, Anne Cocos and Chris Callison-Burch developed this homework assignment for UPenn’s CIS 530 class in Spring 2018.